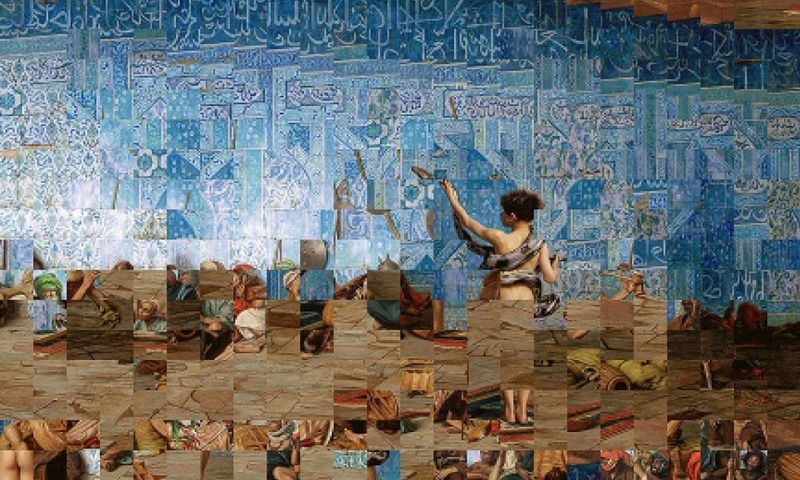 In his work displayed at Art Dubai, Rana commented on the history/practice of orientalism by dismembering various paintings that carry typical orientalist imagery. With its annual art fair becoming a prominent event on the global cultural calendar, Dubai has become an import centre of art in the Middle East. Airports, like humans, are all about time and space. They are also about taking off, levitating, leaving the land and floating in the air. Like dreams. And as our dreams describe our (often hidden) character, an airport discloses the characteristics of a city or a country. A busy airport – such as Heathrow in London – reveals the global importance of the land it belongs to: how that land becomes a meeting point for travellers from across the world. They stay there briefly, encounter people from nationalities they have never seen before and often engage in small talk with utter strangers. Dubai, the city state, is one such international meeting ground — just like its own international airport. This holds true in terms of art too. With its annual art fair becoming a prominent event on the global cultural calendar, Dubai has become an import centre of art in the Middle East. The 12th edition of Art Dubai this year invited 105 galleries from 48 countries, showcasing a wide range of works from the Middle East, North Africa, South Asia and many other regions. Repeating the annual pattern, this year’s fair was divided into ‘modern’ and ‘contemporary’ sections. A new section, ‘residents’ was also, however, added this year. An important feature of the ‘modern’ section was an exhibition, That Feverish Leap into the Fierceness of Life, that featured five artist groups in five Arab cities across five decades. It showcased the work of artists belonging to Cairo, Baghdad, Casablanca, Khartoum and Riyadh. The artworks – especially those from the 1960s and 1970s – reminded the viewers of an artistic language that was distinct for each artist due to its local connections but was still comprehensible across continents due to its contents. The exhibition had its genesis in a quote from the 1951 manifesto of the Baghdad Group for Modern Art. It reads: “If we fail to fulfil ourselves through art, as through all other realms of thought, we won’t be able to make that feverish leap into the fierceness of life.” Taking a cue from these words, the curators made a Herculean effort to fulfil the viewers through art that did help them make that feverish leap. The exhibition served as a significant documentation of the formal, conceptual and cultural approaches of various artists who sought to find a local idiom — apparently rooted in the genre of ‘naïve’ art. The majority of the work on display suggested the featured artists identified with a ‘vernacular’ purity and primitiveness of expression. In terms of their style, imagery and technique, the displayed artworks suggested that their creators were not just conversing with their own part of the world, once described as the Third World, but also with other regions through a visual vocabulary that had many layers to it and yet had many shared elements. One could, thus, recognise features of some Indian paintings appearing on canvases from Egypt and formal issues found in work from Pakistan being visible in artworks from Jordan. The ‘modern’ section also included a show by a large number of Pakistani artists: Rasheed Araeen, Zahoor ul Akhlaq, Ismail Gulgee, Ahmed Parvez, Sadequain and Anwar Jalal Shemza. Displayed at Grosvenor Gallery, the exhibition featured some of the most unusual works by Shemza, Akhlaq and Gulgee. In the same show, Araeen’s geometric constructions revealed his long-term engagement with a formal language rooted in the history of image-making in Muslim cultures. After years of living in oblivion, Araeen is now being given his due recognition and respect and is becoming a part of many important international art events. He was also represented at two other galleries in the ‘contemporary’ section of Art Dubai. Grosvenor Gallery had a special booth for his work, primarily showcasing his paintings that explore geometry, and Aicon Gallery presented his minimal structures, along with works of some other Pakistani artists. 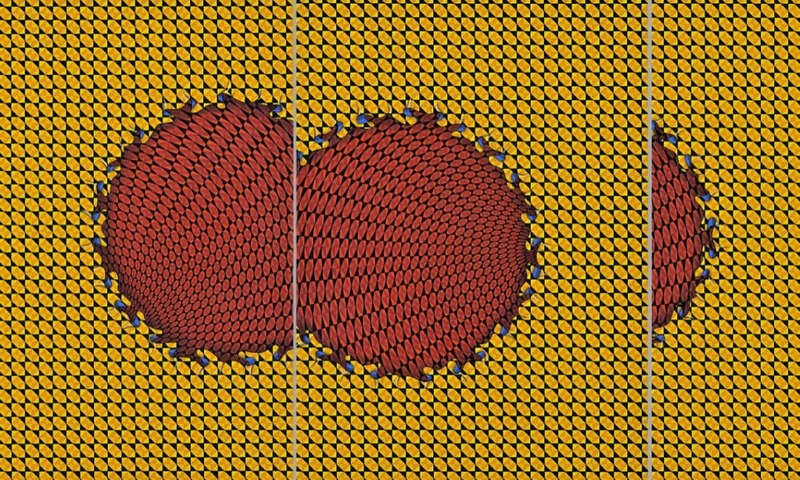 These structures with painted parts linked his imagery to op art that employs optical illusions. Two galleries from Karachi also had their booths at Art Dubai this year — each featuring a single artist: Muzzumil Ruheel at Canvas Gallery’s booth and Muhammad Zeeshan at the one by Sanat Initiative. Ruheel showed “a body of work that talks about the pauses; the time between two words or sentences”. The artist’s interest in language and its opposite – silence – was evident in the way he composed his imagery in subtle shades of dark grey letters. Zeeshan, on the other hand, “addresses the construct of originality. Or the fascination with authenticity, that becomes a fetish.” His works looked identical and were described as copies of each other but were priced differently, mocking the consumerist craziness of the art market. The artists critiqued how the sellers and buyers of art are more concerned about artworks being ‘real’ and ‘fake’ as opposed to being interested in images, ideas and the issues explored. An analysis of the notion of originality and authenticity is a permanent feature of Rashid Rana’s work too. He does this analysis through his highly sophisticated imagery that embodies many aspects of our sociopolitical circumstances. Issues such as identity, tradition and the changing fabric of society constitute prominent elements of his art. In his work displayed at Art Dubai, Rana commented on the history/practice of orientalism by dismembering various paintings that carry typical orientalist imagery. Exhibited at Leila Heller Gallery, his artefact also challenged the convention of ‘painting’ since it was in the digital genre. This interplay of imagery and medium allowed the artist to deconstruct the edifice of tradition at various levels. A number of other artists at Art Dubai approached the tradition of image-making in various other manners. Aisha Khalid’s works at Zilberman Gallery, for instance, illustrated the artist’s attempt to create a sense of space by manipulating the possibilities of geometry. A similar effect of infinite space was also aimed at by Waqas Khan (at Galerie Krinzinger). His small work on paper engaged spectators due to its intricate marks. Entangled in the web of his marks, the viewers would experience immensity in tininess. Galerie Krinzinger displayed some big names from the art world — such as Marina Abramovic, Maha Malluh and Sudarshan Shetty. The last one of these artists has also been reflecting on the idea of tradition, using a sophisticated pictorial diction. For his work displayed in Art Dubai, he selected a broken china tea set and redid it by adding pieces made of wood where the china had gone missing. Shetty’s carved wooden carpet was exhibited at Leila Heller Gallery. With its corner slightly turned, it looked like a woollen rug and could be seen as a symbol of transformation in tradition due to political, cultural and commercial reasons. Pakistani artists Hamra Abbas, too, explored the theme of tradition and modernity through a carpet which, in many ways, is a quintessential representative of our tradition. She created a work, titled Please Do Not Step: Loss of a Magnificent Story, connected to flying carpets that recur in old tales featured in the Thousand and One Nights. Displayed at Lawrie Shabibi gallery, this text-based work in marble was placed on the exhibition floor, with visitors walking on it. References in her text include “a flying carpet personified, its possible transformation into an aeroplane and the scattering of migrants around the world’s oceans”. The text was shaped in such a way that it looked like “a magic carpet zooming into space”. Another artist from Pakistan, Abdullah M I Syed (who also has created flying carpet installations in the past) invoked the link between art and money by using dollar bills as the material to compose his geometric forms. For a number of years, Syed has been utilising currency notes for his works on paper, installations and performances. His work at the Aicon Gallery was a continuation of the same sensibility/style. Anish Kapoor, an Indian artist, treated the theme of tradition in a different way — by liberating it from a fixed culture or location. His large disc with deep blue hues enthralled the spectators with its illusion of infinite space. Both its circular form and pigment invoked popular Indian pictorial practice but it was stripped from an easily identifiable address or interpretation. Kapoor’s work was displayed at Galleria Continua along with works by Ai Weiwei, Michelangelo Pistoletto, Ahmed Mater, Daniel Buren and several other celebrities of contemporary art. The sculpture by Ai Weiwei, an entangled wooden handcuff, demonstrated the distance between openness and captivity and the difference between freedom and restrictions. It was a perfect reminder of the situations and conditions people have to face in countries going through political turmoil where various modes of state repression are also pervasive. Political turmoil, a familiar feature in countries once called the Third World, indeed, affects artists in multiple ways, as was obvious from the work of Afghan artist Lida Abdul at Giorgio Persano gallery. She recreated the unceasing war her country has witnessed through 80 framed photos initially “belonging to an Afghan passport photographer”. These conveyed how “war affects the expression of men, women and children over a span of twenty years”. Art Dubai 2018 emphasised the importance of having an artistic centre that is expanding and consists of diverse practices and different projects such as the Abraaj Group Art Prize (won this year by Beirut-based contemporary artist Lawrence Abu Hamdan). Several Pakistanis – including Hamra Abbas, Risham Syed, Huma Mulji Basir Mahmood – have been among its past winners and runners-up but this year no Pakistani artist even entered the competition. This, however, was compensated by the fact that Rashid Rana was a part of the jury for this year’s prize. A Pakistani judging artworks from various parts of the wold suggests something important — that Dubai continues to break boundaries and borders when it comes to art and ideas. The writer is a Lahore-based artist, art critic and educator.